Though significantly different in style, subject and tone, artists Allan and Lisa Tubach, father and daughter, share a similar family trait and theme: an interest in capturing aspects of the world that, for different reasons, are on the verge of disappearance. Hence, a fitting title for Gallery 1516’s current exhibition, Tubach + Tubach: Preservation, which continues through Nov. 27. Yet, while Lisa and Allan have been exploring issues of preservation in their work for years, their personal interests and stories have taken them into different directions: environmental sustainability for her and cultural heritage for him. However, knowing of their separate stewardship alone does not do justice to their individual take on vivid, dramatic and detailed imagery. Lisa is an Omaha-born, Virginia-based artist who has been showing locally (primarily through the Anderson O’Brien Gallery) and around the country since the early 1990s. She is following in the footsteps of her father, Allan, who has been active since the 1970s. Many of his works have found their way into institutional and corporate collections, not to mention the Nebraska governor’s mansion. The differences between these two painters are immediate. 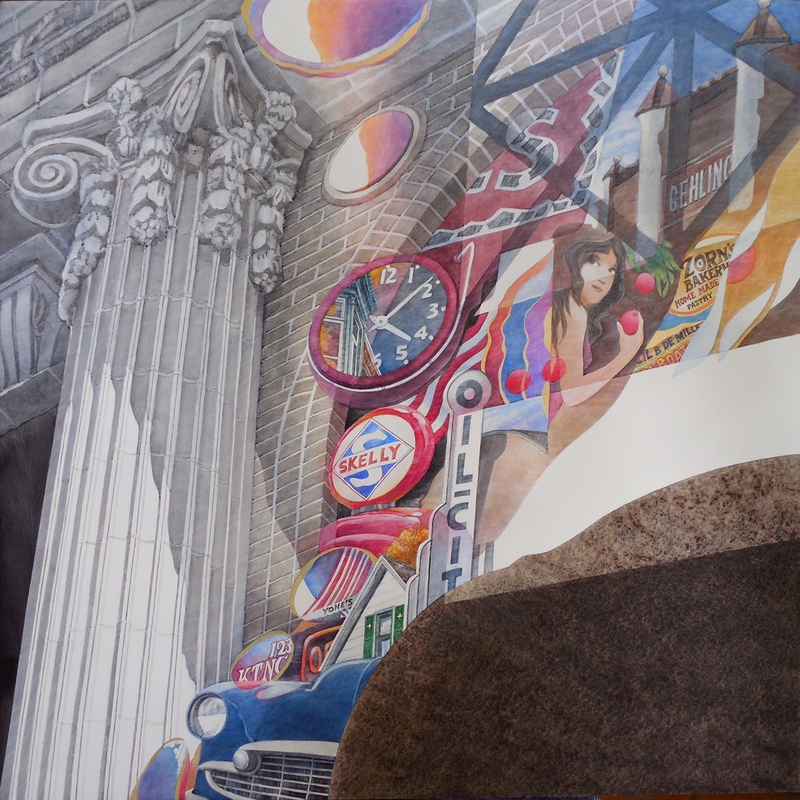 Allan’s paintings consist almost entirely of fractured portrayals of a man-made world: buildings, windows, signage, sculpture. Lisa’s paintings, on the other hand, derive much of their imagery from nature and from the sea in particular. 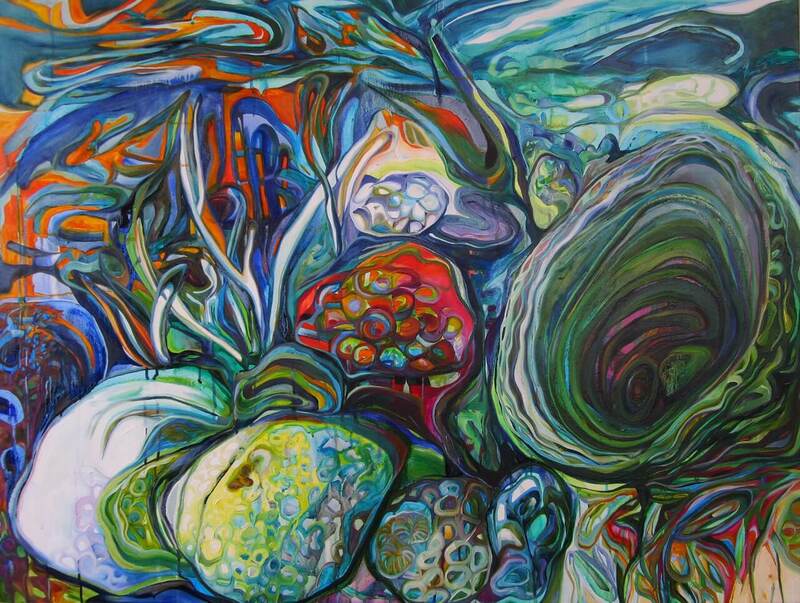 Her paintings are crowded with plants, animals, and the movements of water and air. There is also a difference in palette that is pronounced, particularly when these paintings face each other across Gallery 1516’s generous space. 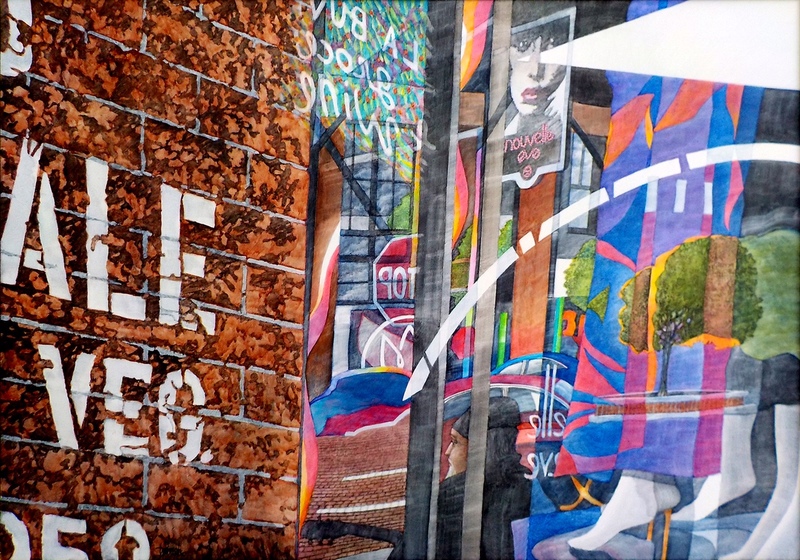 Allan’s colors are often pale, in part because so much of the cityscape they portray is grey and in part because the colors are frequently viewed through one another and thus must exhibit some transparency as they converge in a jumble of perceptions. What brings these painters together is the quest — shared with perhaps all painters — to decide how to organize the swirl of objects and sensations that each seeks to capture. Both are faced with the question of how to compose their images, even when the goal is to portray a moment that exists beyond representation. You can feel the forces of composition, for instance, in Allan’s “Shadows on Stone,” in which a cascade of commercial ephemera (a gas-station logo, a bakery sign, a smiling Eve-like figure with a few apples to sell) spills from the upper-right corner of the painting to the lower left. This bisects the image as a whole into two triangles, one a piece of classical architecture, a remnant of past order, and the other a surprising display of minimalist painterliness, with three slices of color (earth-tone, beige, and white) stacked one on top of one another. Perhaps because her subject matter is organic, most of Lisa’s paintings seem to emanate outward from a throbbing heart, a collection of shapes and colors that is more compacted than the image as a whole. This is most clear in “Humming/Sudden,” in which this throbbing heart (shaped vaguely like the head of a lamb) is emphasized by its juxtaposition with a more sparsely populated area of canvas and crisscrossed by drips of paint. Allan’s paintings draw on Italian Futurism’s love affair with urbanism and motion. Indeed, his paintings are most persuasive when they draw on Futurism’s angularity to direct the energy of his paintings to a point of sharp convergence where modernity, commercialism, and perception come together. In “Full Circle,” for instance, the portico of Omaha’s J.P. Cook building and one of the glass faces of the Holland Center slice through the space of the painting and collide at a point where a neon “Open” sign and reverberations of light suggest that we have stumbled upon of those moments when life in the city offers a fusion of abstract shapes or surreal life forms. In “Cloud Columns” from 1991, two slices of sky sweep down from above, met by a stretch of highway markings that at first converge but then curve and swoop in a manner that throws the view back into the space of the painting. Given that Allan is driven by an interest in dynamism and change, it is odd that there are very few signs in his painting of actual decay of the kind that can seem depressing: rusty metal, peeling paint, litter, crumbling infrastructure, etc. His scenes are attractive and carnivalesque, swirling around the view rather than leaving him or her feeling alien or displaced. There are no humans in Lisa Tubach’s work, and aside from a few fish there aren’t any animals either. What there is is energy in the form of interlocking cellular shapes in bold colors that are usually meant to represent coral reefs and other natural forms. In a recent, large (60” x 48”) oil painting entitled “While We Are Sleeping,” the top half of the painting is taken up by the water’s surface, which in its undulations catches only hints of the tempest of orange and red going on below. Another recent work, “Caesura (Too Hot Bivalve)” provides a direct suggestion of how climate change is throwing ocean environments out of balance, to the point of destroying some of those environments forever. Given this reality and the artist’s espoused interest in this reality, it is striking that Lisa’s painting capture more vitality than they do destruction. 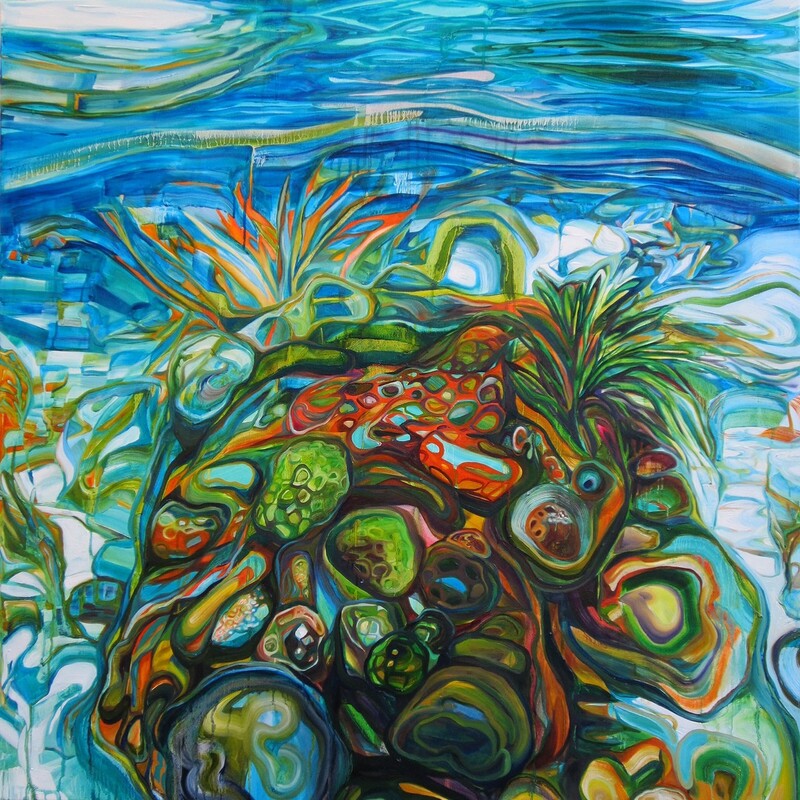 The coral reefs in her paintings are alive with color, not bleached, perhaps underscoring the artist’s latent optimism. It also bears mention that, because Lisa’s ocean paintings are so absorbing on so large a scale (the largest here is over seven feet tall), one might not fully register the smaller, more delicate and usually non-aquatic works that are the backbone of her half of this show. Most of these smaller (usually 32” x 40”) works are done in gouache rather than oil or acrylic. Gouache is most substantial and more opaque than watercolor, but nonetheless similar to watercolor in its fragility and absorptive relationship to the canvas or paper surface. Nowhere in this show is this more clear than in the 2012 work “A Day of Perfect Light,” a luminous work capturing a gathering of grasses—in brown, black, yellow, and green—bending toward mortality and yet staking a claim for beauty in the most unexpected places. Preservation may be what drives this exhibition for both Tubachs, each in their own manner, but at no time does the viewer feel that this is work of desperation or hopelessness. Perhaps it’s because father and daughter preserve something more than a reasonable expectation of change for the better for both the environment and our cultural heritage. They confirm the vital contribution artists make on behalf of both. Tubach + Tubach: Preservation will be on view at Gallery 1516, located at 1516 Leavenworth in Omaha, until November 27, 2016.